Why do you burn so much fat on the Almased Diet? On this diet, you are using Almased as a meal replacement which creates a calorie deficit. Since these calories are suddenly not available, the body takes them out of its fat reserves. At the same time, the body continues to be supported by Almased’s high quality protein and ingredients, so muscle mass is protected during the program. Please keep in mind that everyone loses weight in a different manner, so weight loss results may vary. Have Almased and the claims for weight loss been researched? Yes, Almased is supported by clinical studies at universities and medical institutions in Germany and the US. The results of these studies have been published in international scientific journals. Do people who are lactose intolerant have trouble taking Almased? Almased has very minimal (trace) amounts of lactose and because of the special fermentation process, most lactose sensitive people do not have any problems. If you have a lactose intolerance or are allergic to soy, yogurt or honey, talk to your doctor or speak to the Almased nutritionist at 1-877-256-2733. Must I curb my activities during the Almased Diet? While on the Almased Diet you will be fully capable of handling your normal workload and daily activities. Exercise is not necessary to have success on the program but can accelerate your weight loss and help with weight maintenance. Therefore, it is strongly recommended. During the Starting Phase, start with a slower exercise routine and stop if you feel exhausted. Why do I need oil in my diet? Fat is the main energy supplier for the human organism. It is vital that you consume fatty acids of high quality, essential fatty acids (EFAs) such as omega-3 and omega-6, even when you are on a diet. EFAs help to improve your metabolism and may lower elevated cholesterol and high triglycerides. EFAs are also required for normal brain development and efficient brain function. They are also necessary for your body to fully absorb certain vitamins. Common EFAs are olive, flaxseed, walnut or canola oil. It is unhealthy to completely cut out those healthy fats from your diet. We therefore recommend 5-7 tsp of oil (such as flaxseed, olive, walnut and canola oil) per day. You can mix 1-2 tsp of oil in each Almased shake. If you are on the liquid diet, you can also add the oil to the vegetable broth or use it to prepare your regular meals for the phases thereafter. How do I mix Almased? Dissolve Almased in 10 to 12 oz of cold bottled or filtered water, skim milk, unsweetened almond or soy milk. To ensure an adequate supply of essential fatty acids, add 1-2 teaspoons of oil (flaxseed oil, walnut oil or olive oil). The goal is to consume 5-7 teaspoons of one of these essential oils into your diet per day. Add cinnamon, unsweetened cocoa powder or flavored extracts for variety. How much Almased do I need to take? The general serving size for Almased is 8 level tablespoons per shake mixed in 10-12 oz of cold liquids. If you would like to be more specific, you can go by your body height: If you are shorter than 5’6”, take 6 level tablespoons; if you are between 5’6” - 6’, take 8 level tablespoons; if you are taller than 6’, take 10 level tablespoons. Can I mix Almased in my hot coffee or tea? No. Almased cannot be mixed with hot liquids because extreme temperature change, whether higher or lower, can change the proteins and reduce their solubility, digestibility and bioavailability as well as destroy the enzymes in Almased. Can I mix Almased with fruit juice? You can dilute fruit juice with water (1/4 of juice to 3/4 of water). However, keep in mind that fruit juice contains sugar even if it’s 100% fruit juice. For some people, it is harder to lose weight if sugar is added to their diet. If you seem to be having a harder time losing weight, please talk to the nutritionists at Almased (1-877-256-2733). Can I use tap water? No. It is not recommended to use tap water since chlorine is added to most city waters. Chlorine destroys the enzymes in Almased which decreases the effectiveness of the product. Therefore, we recommend mixing Almased with bottled or filtered water. Can I flavor the water? Yes, try adding lemon, orange or cucumber slices to water for a different flavor. You might try a drop of vanilla or any other extract or a dash of cinnamon. Can I pre-mix Almased and let it sit for a while? No, because of the active enzymes in Almased, it should be made fresh and consumed immediately. How do I store Almased? Store it in a dry and cool place. If you live in a very hot and humid climate and your house is not air-conditioned, you should refrigerate the opened can. Can I continue to take a multi-vitamin while on the Almased Diet program? Yes, you can continue using a multi-vitamin while on the program as well as on an ongoing basis if needed. Vitamins and minerals are the basic foundation to optimal health. A multi-vitamin is a convenient and easy way to take all the necessary nutrients in one supplement, in order to prevent deficiencies. However, we do suggest trying to get your nutrients mainly from food and use supplements as the 2nd source since absorption of nutrients from supplements might be lower. Why is the vegetable broth important? We recommend preparing a fresh vegetable broth and consuming it between your Almased shakes, especially if you are on the liquid diet. The vegetable broth provides you with important vitamins and antioxidants to fight free radicals you may be producing during this phase. It will also help to curb your appetite in between meals and will add to your daily amount of liquids. If you cannot make the broth yourself, we recommend 100% vegetable juice, ideally low in sodium. Chicken and beef broth are not a substitution for the vegetable broth. Will Almased interact with my medications? No, Almased is an all-natural nutritional supplement and does not react with medication. However, we strongly advise you talk to your doctor before starting on any diet program. In addition, we recommend seeing your doctor 6-8 weeks into the diet to get a check-up and to see if medication may need to be adjusted. Will Almased affect my thyroid? You have to consider several facts when having problems with your thyroid or taking thyroid hormones simultaneously with Almased. Theoretically, consumption of soy products may inhibit the absorption of thyroid hormones. So far, we haven’t seen any correlation between thyroid medication and intake of Almased, if the medication was taken as prescribed. If you want to be on the safe side, you can talk to your doctor and schedule an exam of your thyroid or thyroid hormone levels before and about 6-8 weeks after the diet. However, we can say that other mechanisms such as supporting healthy blood sugar and satiety regulation as well as complete preservation of muscle mass, are important effects of the Almased Diet. These benefits can be utilized, independently of the effect on the thyroid or thyroid hormones, in order to stay healthy and to lose weight permanently. Why is it a good idea to take Almased before and/or after my workout? Almased’s high quality protein and amino acids will increase stamina and endurance during your workout. Furthermore, exercise provides a signal for your body to build lean muscle mass and breakdown fat. Almased is ideal as a pre-workout snack. Exercise also depletes your body. Almased with its complete protein is a great post-workout meal for anyone needing to replenish proper nutrients for muscular health. What does a healthy meal consist of? The meal should consist of about 500-700 calories. You can have a lean cut of meat (such as skinless chicken), fish or tofu with raw, steamed or cooked vegetables and whole grains. Try to stay away from refined sugars, white rice, pasta, white breads, candy, cakes or any overly processed, fried or prepared foods. These contain excessive artificial ingredients and preservatives your body does not need. 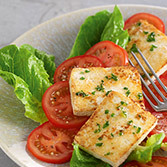 Example: 2-3 oz (size of your palm) of skinless chicken or fish, 1-2 cups of green leafy vegetables or a salad with olive oil and vinegar dressing and ½ cup of brown rice. If you get hungry between meals, snack on 3-4 tablespoons of Almased® mixed in water, low-fat yogurt or skim milk. You can also eat vegetables or a handful of nuts (e.g. walnuts, almonds or pistachios) as a snack. Can I chew sugar-free gum? Yes, you can chew sugar-free gum in moderation. Be aware that most sugar-free gums contain artificial sweeteners, such as sorbitol. Sorbitol is a widely used sweetener in “sugar-free” foods. It can act as a laxative and also cause stomach problems if taken excessively. 5-20g of sorbitol could be enough to cause minor stomach problems and each stick of chewing gum has around 1.25g of the sweetener. Can I have sugar/carb drinks, diet soda, wine or beer while on the Almased Diet? Try to avoid sugary drinks or sodas (even diet sodas) because they might make you even hungrier and slow down your weight loss. Sugar, alcohol and caffeine may stimulate hunger pangs. Alcohol also slows your metabolism. Can I drink coffee during the Almased Diet? Yes, you can have 1-2 cups of coffee per day. Caffeine may raise the hormone cortisol that can block fat burning. Therefore, try to limit your consumption to 2 cups a day. Consume green, herbal or black tea or decaffeinated coffee for best results. Can I use an artificial sweetener while on the Almased Diet? Yes, but many artificial sweeteners have ingredients that may harm your body (toxic side effects, tumor growth in animal studies, etc). Try to limit consumption of artificial sweeteners or try Stevia®, a natural sweetener. After reaching my goal using the Almased Diet, must I spend the rest of my life eating strictly low-calorie meals? No, when you lose weight with Almased, you lose fat and retain muscle mass and keep your metabolism active, which means that you don’t have to worry about the yo-yo effect. Continue with a healthy lifestyle, eat sensibly and exercise to prevent going back to old habits and gaining weight again. You can also use Almased as a meal replacement and weight management tool after you reach your goal. A good way to do this is to replace a meal or two with Almased when you’re going to have a large dinner or need to skip a meal. Mix a drink with Almased 30 minutes before you go out to eat. You won’t be as hungry and will eat less. Example: No time to cook a healthy breakfast or lunch? Instead of eating fast food or a high carbohydrate, high sugar meal, consider an Almased shake or smoothie. Just add Almased to your favorite smoothie recipe. Will I gain the weight back when I go off Almased? No, you should not. In conducted studies, people who used Almased kept their weight off even after 6 months of not consuming Almased. However, it all depends on each individual and how you proceed with your lifestyle. Almased is the beginning of a lifestyle change and it was this change that helped you achieve the weight loss. If you go back to the same lifestyle and poor eating habits that made you gain weight to begin with, inevitably, the weight will return. Incorporate exercise into your daily routine, along with healthy eating habits. The secret to sustained weight loss is now yours. Adopt these new habits and continue to be the healthier and thinner you!